There's snow on the ground and the days are short, but my team has done good work in the batting cages over the last few weeks. My approach is to break the 11 kids into small groups for batting practice once or twice a week. With only four or five players per session we are more productive and I get to know each kid better and provide more individualized instruction. This schedule, though, means I'm busy three or four nights a week. Several kids juggle this with practice and game schedules in their other sports. Four kids play basketball on three different teams (each with its own schedule) and one is wrestling. The overlap between the seasons of youth sports is only getting worse as the kids get older, and it is, I believe, a troubling trend in youth sports. Many coaches in all sports frown on their athletes playing other sports because it interferes with their efforts throughout the year. They pressure (or coerce) kids to choose one sport at an early age. The logic, stated or implied, is that if some of their teammates play year-round, then to remain competitive or risk losing their spot, they must specialize. That's a shame. The coaches win and the kids lose. Take basketball for example. There are leagues year-round because court time is always available (except, ironically, in-season). Many coaches expect their kids to play all the time. The theory is that if kids are constantly on the court, then, when the season rolls around, they'll be better than the kids that played football, baseball or lacrosse. However, it is the program - not the individual kids - that enjoys the biggest gains. Developing teamwork, choreographing defenses, and memorizing plays takes time and practice. Drilling this for 12 months is great for the program. But is it healthy for the kids? Probably not. Burnoutis the obvious first reason. Playing the same sport every day for long periods of time - no matter how much you love it - is a recipe for mental fatigue. I did a quick search on the Internet for "youth sports burnout" and dozens of articles popped up. Again and again they describe kids dropping out of sports altogether as they hit their teenage years because, among other reasons related to coach and parental pressure, it just wasn't fun anymore. Sports have become like work for these single sport kids. They slog to practices showing the same sense of drudgery that many adults display for their eight-to-five jobs. The articles described 10-year-olds practicing soccer four days a week and then playing multiple games on weekends in year-round leagues. Players faked injuries so they wouldn't have to play anymore. Even worse, several kids expressed relief when doctors diagnosed season- or career-ending injuries. All too often, coaches have a win-at-all-costs attitude which prompts them to willingly sacrifice several players in their General Patton-like march towards league championships. With trophy in hand, they all-too-easily replace the casualties with a new batch of recruits eager to play in a great winning program. Who are the real winners? Shouldn't it be the kids who get the most benefit from youth sports, not the coaches? Finally, many articles warn of the dangers of overuse injuriesfrom using growing bones and muscles in the same way year-round. Forget the mental monotony for a moment; the repetitive motion of same game, same skills and same drills is often a recipe for stress fractures, growth-plate disruption, and a wide variety of overuse injuries. It's important to recall that kids take the field because they love the game, enjoy playing with their friends, and relish the thrill of competition. These are the driving forces for youth athletes, not winning or preparing for high school, college, and professional ball. Too many kids get robbed of their childhood fun by the coach's ego . . . and his misguided aspirations of one day coaching the high school team. Perhaps most important reason kids should not specialize is that each sport they play gives them new and different insights into themselves as competitors, and develps new skills, that may be difficult to learn any other way. The quickness and aggressiveness Jimmy learned in football last fall makes him a better base runner this spring. The patience Joey learns waiting for a good pitch to hit makes him a better passing guard in basketball. The different equipment, skills, rules, and approaches to the game that make each sport uniquely fun also make them better all-round athletes. That was my experience in high school. Playing basketball taught me several things that made me a better baseball player - lessons I probably wouldn't have learned as quickly or completely playing just baseball. I enjoyed basketball through my junior year in high school, but I clearly wasn't going to play in college. I wasn't a ball handler or a pure shooter and I wasn't big enough to bang inside with the really big guys. But I enjoyed playing. And I was able to contribute to the team's success by getting loads of rebounds, playing defense, and diving for every loose ball on the floor. I remember one game I was giving up about four inches in height and at least 40 pounds to the big man inside. For some reason, I ended up guarding this gorilla and I got pummeled. I kept trying to play my typical game, which worked against smaller guys, but this goon was pushing me all over the place. It seemed like he scored every time down the court and if I dared take a shot, he blocked it spectacularly. By the second quarter I was beat up. During a timeout I started venting some frustration to a teammate in the huddle. Coach Garrison paused, glared at me, and told me to stop whining. He said I needed to find a way to beat the guy. The only other choice was for me to give up. He asked me very pointedly if I wanted to do that. I fumbled for words, surprised that he didn't take my side and sympathize that I had a tough assignment. Finally I admitted that I didn't want to quit. He stared at me in silence for a few moments and then suggested a few different things to try. I was mad. I was frustrated by the goon who had been brutalizing my body and ego, and still a little angry with my coach. I hustled back on the floor and the next time they brought the ball down the court I tried a few of his ideas. I changed my defensive approach to deny the pass, and on offense looked first to set a pick for my teammates. This worked! I didn't shut the guy down completely - he still had a great game. Eventually, I think, I fouled out near the end of the third quarter, but this mostly frustrating experience taught me how critical tenacity is when things aren't going well. I learned that to be successful, you have to adjust during the game. I know those things made me a better pitcher the next season. Later that year I learned another important lesson playing a pick-up game. The guy guarding me was really good - not so much in his quickness or shooting, but he was so fundamentally sound it took me completely out of my game. He always boxed out on shots (put his body between me and the basket so I couldn't rebound), denied passes to me underneath, and out-hustled me in just about every situation (not quickness, hustle). I found out later that he played college basketball. His effort showed me how completely frustrating it is to play against someone who executes the fundamentals correctly on every play. Afterwards I thought about how executing the fundamentals applied to baseball. I saw that it didn't matter if it was pick-offs to keep base runners close, backing up home plate, or covering first on a ball hit to the right side of the infield, doing things the right way every time would make me better. The experience on the court showed me that my discipline would weigh on my opponents - just like the guy boxing me out on every shot, I wasn't going to give my adversaries anything they didn't earn. The college player forced me to play his style of basketball, which put tremendous pressure on me because I felt I had to take advantage of every opportunity. I began to think about how I could do that on the mound. I'm not sure I would have learned either of those lessons quite that quickly or thoroughly on the baseball diamond. If I had played only baseball I might not have had as much success without incorporating those nuggets into my game. I'm glad my coaches and parents didn't pressure me into focusing on just one sport. The point is that having success in a sport - any sport - unlocks barriers to performance that can be translated to any sport or endeavor. Often these are mental obstacles of connecting hard work to performance or overcoming the big barrier of "I can't." Confidence as an athlete transcends the sport, especially at the younger ages. Learning, as a defensive end, to believe you can get around the big mean offensive tackle - and then adjusting your approach and finding a way to do it - trains the mind and body to believe. Then the next time you're standing in the batters box against the big mean lefty on the mound, it is much easier to believe you can get a hit. You use those same mental muscles to adjust and find a way to put the bat on the ball. It's the same challenge . . . only the skills and circumstances are different. Ultimately, we have to remember our role as adults in youth sports. It's to help the kids learn, compete, develop, and enjoy playing sports. As coaches of youth, our greatest aspirations should be that they have no regrets when they are our age; the worst scenario is the adult that picks up his son's ball glove, smells the leather, pounds the pocket with his fist, and laments, "I wish I would have played baseball another season or two when I was 11." Unfortunately, I believe many coaches wring everything they can from the kid and family. But what does that teach the kids? That it's okay to over-commit and end up doing everything half-way? Shouldn't we be teaching them to do a few things very well, rather than setting unrealistic expectations that they can and should do everything all the time? What kind of role models are we setting for our kids? Shouldn't we emphasize quality of experience over quantity of activity? Less than full efforts waste everyone's time. In the end I come back to asking the question I asked near the beginning of this article: is the goal to help the kids enjoy youth sports or to build a coaching dynasty? 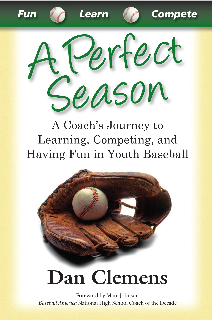 Dan Clemens is the author of A Perfect Season: A Coach's Journey to Learning, Competing, and Having Fun in Youth Baseball (Quiet Path 2010). It is available at Amazon.com, Barnes and Noble and other bookstores. A leadership and communications consultant, he's been a youth coach for 9 years and maintains a website for coaches at www.CoachClemens.com. You can email him at .